Today’s floral filled beauty is the perfect wedding for this May Monday! The sweet couple’s love and joy shines through their beaming smiles in every gorgeous capture by Ryan Ray Photography; and from their soft watercolor palette, to their lush early summer blooms and stunning garden ceremony, it makes for quite the unforgettable, affair….. The summer before senior year, the couple chose an engagement ring, and David proposed on a Cape Cod beach at sunset – how romantic! *swoon* Eager to start the next stage of their relationship, the couple didn’t let graduating get in the way of planning their big day: Tyler graduated on the 9th, David on the 17th, and this beautiful wedding occurred on the 31st. “Our last semester was quite the whirlwind!” says Tyler. 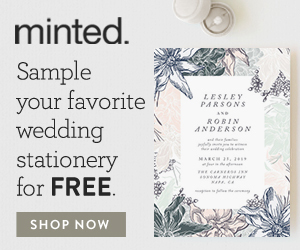 Julie Song Ink designed, calligraphed, and hand-painted the couple’s dreamy watercolor stationery suite. David wore a light grey linen J.Crew suit, and Tyler a vintage-inspired off-white silk and chiffon dress by Saja which she added a bit of sparkle to with a belt from Tessa Kim. Bows + Arrows created the groom and each of the groomsmen a unique boutonniere using poppy pods, ranunculus, scabiosa, china berry, and various herbs, all tied together with lavender, blush, or cream-colored ribbon. The couple chose The Orchard in Azle, Texas, a 100-acre property with 50 acres of century-old pecan trees, because “we wanted a relaxed, semi-rustic, organic feel,” says Tyler. A wooden arbor was dressed for the romantic outdoor ceremony with swags of linen, lace, and more beautiful flowers from Bows + Arrows. The couple’s three-year-old ring bearer suffered a bout of stage fright at the top of the aisle, but recovered once he saw him mom. “He didn’t walk the whole way, but it made everyone smile,” Tyler says. Tyler’s beautiful bouquet by Bows + Arrows Flowers was an asymmetrical cascade of ‘coral charm’ and ‘angel cheek’ peonies, scabiosa, clematis, sweet peas, honeysuckle, and passion vine; a real early Summer stunner! Tyler was supported by six bridesmaids and two maids of honor, dressed in mismatched pretty pastel chiffon dresses. The couple has a gorgeous 1941 Packard, adorned with a “Just Married” sign framed with peonies, garden roses, and clematis, for their getaway car – and it made for some stunning portraits too! An antique stand with floral accent held the menu beautifully calligraphed by Julie Song Ink, whilst the reception tables were set with sage, peach, or silver linens, and lush floral centerpieces that included peonies, scabiosa, and clematis in terra-cotta vessels. The newlyweds cut into the towering spiced-carrot naked wedding cake adorned with fresh flowers by Cakewalk Bake Shop, which sat on a table laden with mini cakes in other delicious flavors like burnt-sugar cake with strawberry, and dark chocolate cake with espresso buttercream – how good do they look and sound?? After their first dance as husband and wife, Tyler took to the dance floor again, this time with her dad, swaying to “My Little Girl” by Tim McGraw. Oh just so so beautiful isn’t it?? The wedding and the photography! And those smiles….. . A huge congratulations to newly weds Tyler and David, and a big thankyou to their photographer Ryan Ray for letting me share their wedding with you. If his fine art style of photography has you swooning and dying to see more of his beautiful work be sure to make your next stop his website ryanrayphoto.com. And you will also find him on Instagram, for daily doses of wedding loveliness. If, as I do, you love this wedding and are looking for more inspiration for your own Summer wedding then you might want to see this gorgeous vintage garden wedding, this rustic barn wedding and the nautical details of this summer wedding are not to be missed!